As the President of IUPAT DC 38, Paddy sits as Chair of the DC 38 Executive Board . 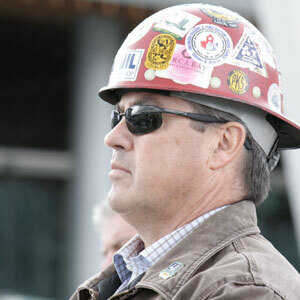 He has also been appointed as the Director of Training at the Finishing Trades Institute of BC. In this capacity Paddy oversees the day to day operations of the FTI which is responsible for all apprenticeship training, journeyperson upgrading and health and safety training for all members of the Council. A veteran of the glazing trade, Paddy joined Local 1527 in 1976 as an apprentice. From there, he worked for many years as a glazing journeyperson, foreman and shop steward until he was elected to a business representative position in 1997. Since then, he has been elected and appointed into roles with more and more responsibility, such as Assistant Business Manager 2005 to 2009, Business Manager and Secretary-Treasurer in 2009 to 2014 and most recently Director of Training. The glazing trade runs deep in Paddy’s family. His dad was a glazier and from him Paddy first learned how important the trades are. As DC38’s Council President and Director of Training, Paddy is dedicated to building the Council for the future, working collaboratively with employers and training the best apprentices and journeypersons in the province.